Whether you are in an intimate private dining room or a huge banqueting hall, Johnny Oxford provides charming and witty magic to give your guests an evening of wonder to remember forever. 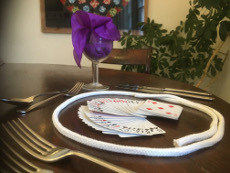 A typical programme would include strolling close-up magic around pre-dinner drinks, great as an ice-breaker, followed by tableside magic between courses during dinner. If you wish you can add a 15-20 minute show of magic, mind reading and comedy for the whole room. This works well after dinner or, if you have speeches, between main course and dessert. corporate events and event organisers from Eventweb.